He has a small brown birthmark near the navel on his abdomen, a small scar on the lower right side of his lip, and crooked upper teeth. Light blue medium sized short sleeve T-shirt with a picture of a black trailer on front, blue stone washed Arizona jeans size 31x29, white size 7.5 FUBU athletic shoes. Unknown. Jose was last seen at approximately 1:30 a.m. at a friend's residence in the vicinity of Moore Road and Dove Street in Alamo, Texas. He has not been seen since. 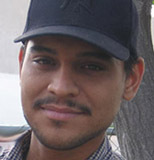 His vehicle is also missing and is described as a maroon, four door, 1994 Chevy Corsica with a cracked windshield, tinted windows, missing piece of right tail light, missing black back door trim on passenger side, imprint on rear window of the name "Gonzalez" and a Tweety Bird character from stickers that were removed, and TX License #R30 SKB. His whereabouts are unknown and his case remains unsolved.